The competitive edge of the eCommerce world has prompted online merchants to look for more effective ways to enhance visibility, search engine optimization and conversion rates. Needless to say, the greater the visibility of your site the greater is the conversion rate. Hence, it is essential for eCommerce business owners to use a robust platform that is scalable, customizable and flexible. Adhering to all this is Magento eCommerce development platform that is chosen by many of the popular online shopping websites. Server And Caching: Enabling browser caching and deploying gzip compression can help in storing and retrieving temporary data from sources across the Content Delivery Network (CDN). This process allows users to experience better accessibility and availability of your site during peak hours. An uninterrupted and fast navigational experience contributes towards the conversion rate optimization of your site. Optimization Of Code: Unnecessary Apache and PHP modules can be uninstalled and replaced with PHP accelerator. Optimizing the code by fixing the loopholes in both back-end and front-end codes can also help the site to perform well. Hosting Environment: The optimization of your Magento eCommerce store can be determined by your traffic handling capabilities. Hence, it is necessary to choose a server that can handle the traffic you expect to your site. It is also essential to choose a server that is placed close to the location of the target audience. Auto Scaling helps with the server resource scaling process during high traffic periods. During high-volume occasions, especially holiday seasons, your website will receive heavy traffic which may lead to slow load time of your site. With the use of auto scaling, you have access to t an extra server, which will help you manage more traffic during such situations. 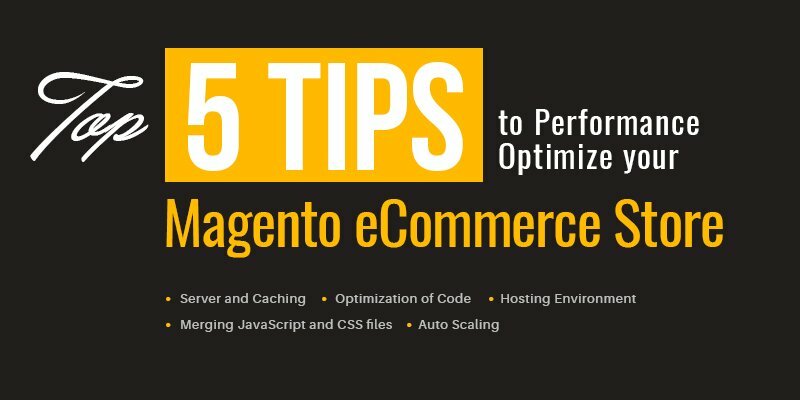 There are many tips and tricks to optimize the performance of Magento eCommerce websites. However, not all the ways work for all businesses and workflows. Hence, it is important to get a consultation from expert Magento Development professionals. Our expert Magento developers can help you deploy effective SEO strategies for your Magento eCommerce store, which not only increases your traffic, but also helps achieve higher conversion rates. What are you waiting for? Contact our Magento professionals now to start the journey towards the success of your eCommerce store.